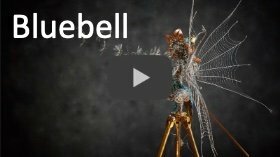 A new fairy called “Bluebell” has been brought into the world. Bluebell came about as an idea I had over Christmas. When I first started making fairies, I made a tiny fairy (6 inches) that sat on its haunches. I thought I’d make a bigger one in a similar pose, although the design does test my rules a bit: In my book “The Art of FantasyWire” I advise avoiding poses that are closed up as it’s difficult to get in to work and the texture of the wire can make it difficult to distinguish features and details. With this in mind, I tried to work the design, so I could as least get around the arms and legs. It worked out okay, but its wasn’t easy and its was quite difficult to keep the lines of the leg muscles clear. So all in all, I’d say my rules are pretty well founded. In the fairy world, spiders are big game hunters who often kill things many times their own size. Legend has it that a long time ago, a fairy was grounded during a thunderstorm and got caught by a spider. All the spiders know the legend and seek to bag a fairy as the ultimate prise. So spiders are the mortal enemies of fairies. I wanted to create a sort of scene / story where the fairy is perched onto of a post. She has cobweb wings which are attaching the spiders so she’s trying to be quiet. I didn’t set out to call her Bluebell. I wanted to create a big floppy hat made from the trumpet of a flower, but thought it would be a copper colour. I made the fairy as per the sketch with copper hat and dress. If you saw my mermaid, I chemically aged the copper to turn it green / blue (verdigris) and then polished the scales up again, using the green to highlight the scales pattern. I thought I’d try the same technique on Bluebells hat and dress. The hat worked perfect, but when I re-polished the dress, it just looked grubby, so I retreated it and left it green / blue. Its quite a striking blue colour and I’m pleased with the result. When she was finished and wanted to give her a name and I re-read all the Facebook suggestions. As soon as I read “Bluebell” (suggested by Christine Watson) it was so obviously the right name. Click on the image to visit the galley to see a couple more images of her or on the youtube thumbnail to see a short video. Absolutely beautiful and stunning, I hope to get back to Trentham Gardens to see them for real soon (my daughter was at Stoke uni for 3 years and went often then). I have followed your page for a number of years now and have even completed one of your kits. 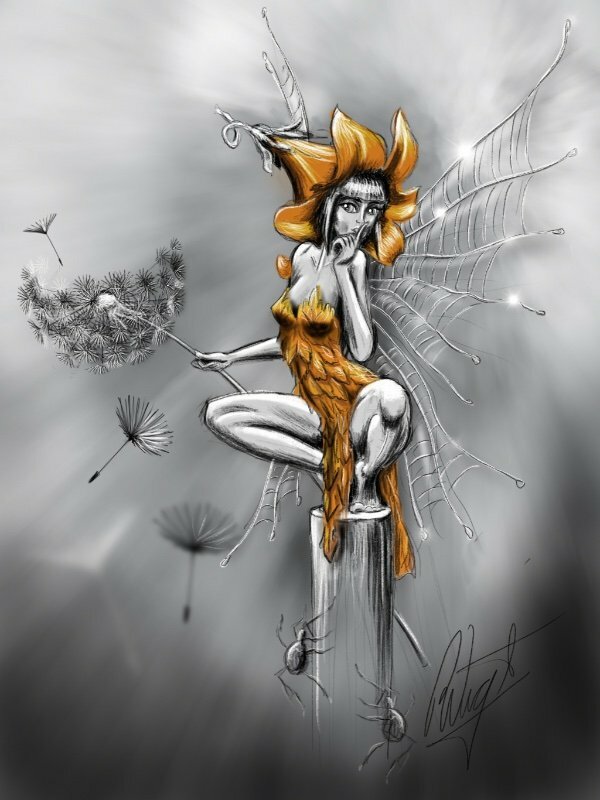 You have an amazing ability to capture the essence of fairies, love your drawings too. Absolutely gorgeous and magical! 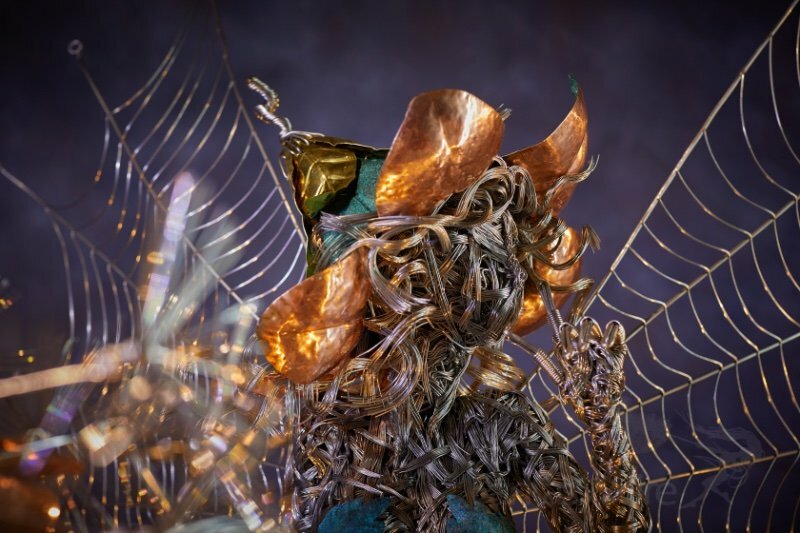 Are any of your fairies on display in the United States? Most of the fairies tend to end up in US but only to private buyers, so unfortunately there is none on display. Hello,I would love to buy some of your fairies for our new woodland here in the uk,would you please let me know how to do this,thank you.